You probably know the story by now; after all, it put Virginia into the national news cycle. 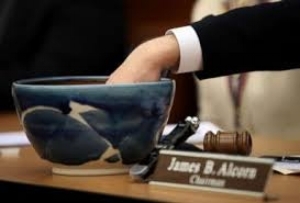 Republican David Yancey maintained his seat in the Virginia House of Delegates when his name was drawn out of a bowl last week. It was the final step in an election process that saw the initial vote on Election Day end in a tie. The Commonwealth came under heavy criticism because the election was decided by drawing a name from a bowl. It is, admittedly, a bizarre way to decide an election, and yet, everything was done according to the law. The subject of this post is to take a look at the law that decided this election and discuss what needs to be done to avoid silly things like this from happening again in the future. Once it was determined that the vote between David Yancey and Shelly Simonds was a tie, a process had to be followed to break that tie. The Code of Virginia is clear on how to do this – well, sort of. “If two or more persons have an equal number of votes…the electoral board shall proceed publicly to determine by lot which of the candidates shall be declared elected.” The tie had to be broken “by lot.” Okay, now what does that mean? In Virginia, it means putting the names in small film canisters and drawing them from a locally designed ceramic bowl. James Alcorn, the chairman of the Board of Elections, told The Washington Post the day before the drawing why the names were placed in film canisters. Whenever the order of the candidates’ names needs to be determined for an election’s ballots, those same film canisters are used in a random drawing. Public opinion was pretty negative about this tiebreaking process. Understandably, most people spoke up about the silly nature that this vote was resolved. However, it has been in the Code of Virginia for many decades. In fact, the only time that the “determination by lot” law was challenged was 1918 in a case called Gregory v. Hubard. Amazingly, deciding the tie by random drawing was not the contested element of this law; it was how the drawing must be done. Note that the law quoted above says that “the electoral board shall proceed publicly” (emphasis added). The public nature of the drawing, and not the drawing itself, was at stake. Looking into the future, though, it is probably time to reconsider the determination by lot. If this vote has taught us anything, it is that no portion of the Code of Virginia is safe from random occurrence. Anything is possible to happen. It is time for lawmakers to read the laws in place and make sure they work for the twenty-first century. Businesses – law firms included – audit their resources on a regular basis. If policies and procedures are in place, those items need to be evaluated and reconsidered. It is time for the General Assembly to do the same thing with the Code of Virginia. When was the last time it was read in its entirety and audited for our present day? Regular readers of this blog know that the laws impact Virginia’s citizens on a daily basis. A defense attorney’s job is to know the laws and assist citizens when they are being accused of breaking them. This “lot” law is not something that will be part of a criminal trial, of course, but it is further proof that the law is not perfect. Improvements need to be made. The General Assembly needs to make them. Meanwhile, if you are in need of a defense attorney because of a different law, call or e-mail today for a free consultation!